I was very fortunate to spend some valuable reading time every week during our third quarter with seven 5th grade students. Their language arts teacher, Andrea Hernandez, wanted to provide these students with a more personalized approach to close reading instruction. All seven students are excellent readers and we decided to challenge them with an unabridged classic, Around the World in 80 Days by Jules Verne. Since these students are in our pilot 1:1 iPad classroom and because I’ve been looking for a reason to give it a try, I decided to immerse our little group in a digital reading experience of this classic novel via Subtext for iPad app. 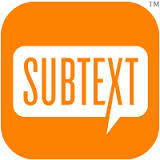 Subtext is a product of Renaissance Learning company (yes, of Accelerated Reader software fame), designed as a “collaborative ereading experience for K12 classrooms.” I chose to use the free, basic version of the app, which provided us with enough functionality. 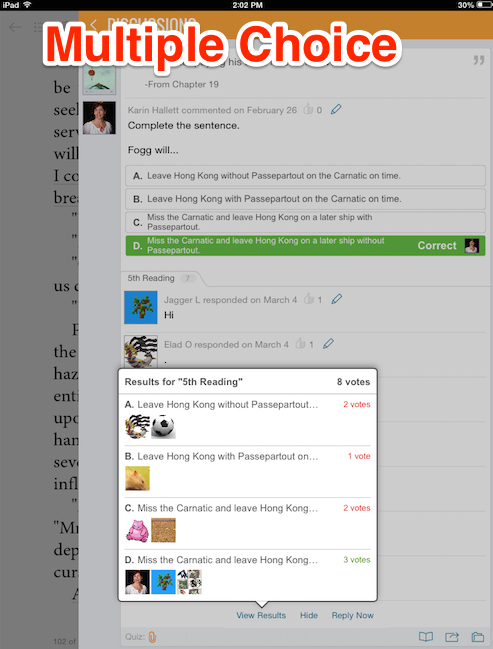 Alternatively, for a fee, users can upgrade to the premium features, offering access to CCSS-aligned assignments, text-to-speech option, and access to leveled nonfiction and informational texts. The only premium feature I would have liked to try out is the ability to track student progress. 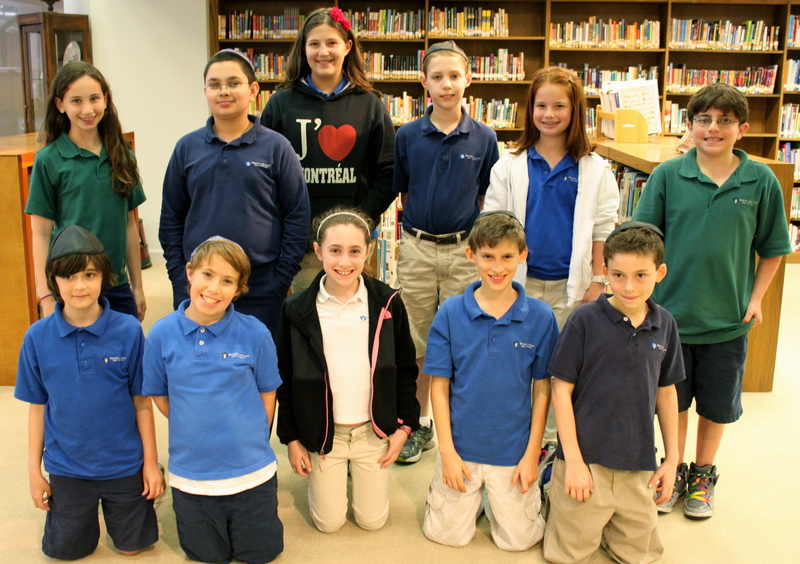 But since my group consisted of only seven students, it probably would not have made a difference. The basic version provided us with enough adequate functionality to upgrade our novel study to a new form of a social reading experience. 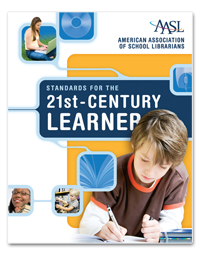 The app offers access to a large collection of ebooks, some for a fee and some are free. Since our classic is available in the public domain, we all downloaded a free version of Around the World in 80 Days directly into the app. 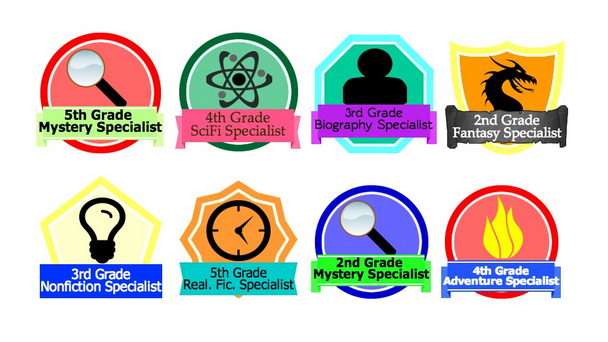 I then created a “5th Grade Reading” group, inviting all seven members to join. Instructors have the ability to “enable student restrictions”, effectively preventing students from navigating the Web and sharing notes. I am not sure what the point of such restrictions is in an ereading environment, so opted to not turn them on. Mostly students read outside of our limited class time. 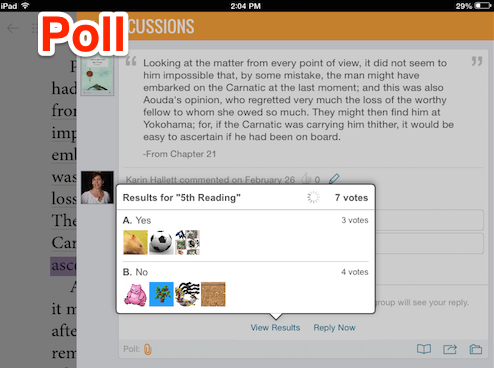 To ensure students were reading more deeply and to assess understanding, I built discussion questions, multiple choice assessments, and polls directly into the text. 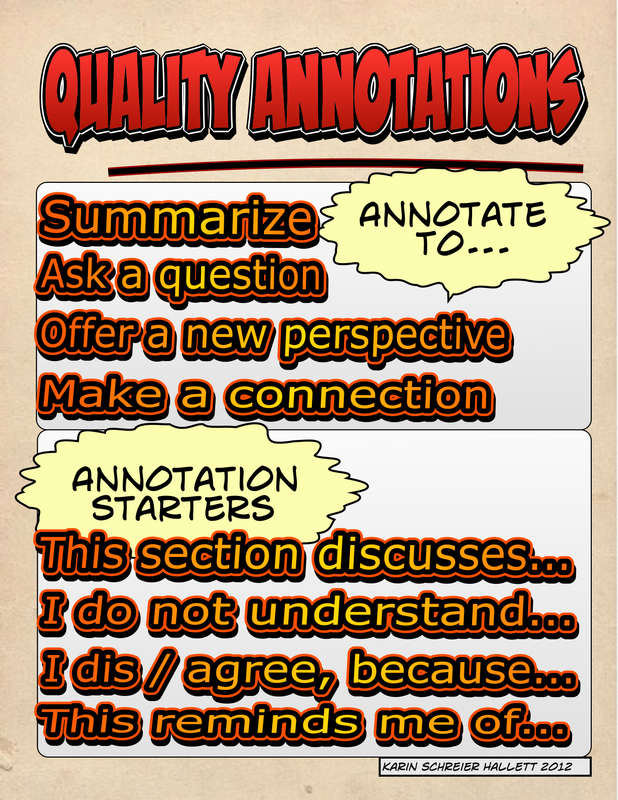 These features allowed me to view and assess student responses prior to our next meeting in order to then focus on those parts of the text that needed clarification. As the teacher, I had the option to hide all responses until students submitted their answers. Another value-added feature of Subtext is the ability to embed links to websites, images, or videos. To help build background knowledge, I linked to information about the author, the Suez canal, a map of the British colonies and another of colonial India, an image of a cow catcher mounted to the front of the old American locomotives, and more. 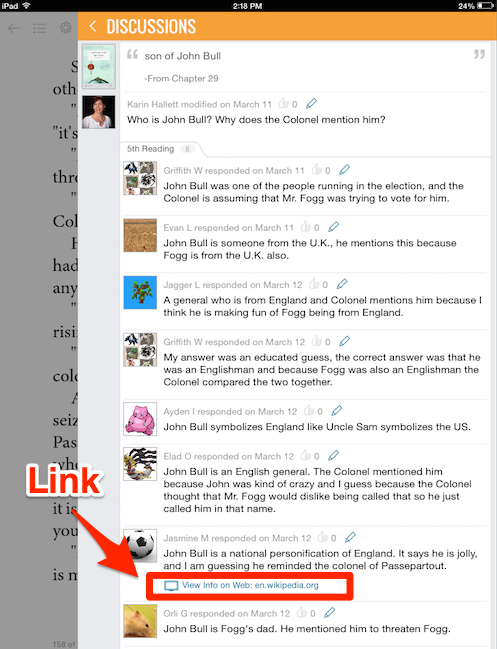 Students also were able to embed links into their comments. 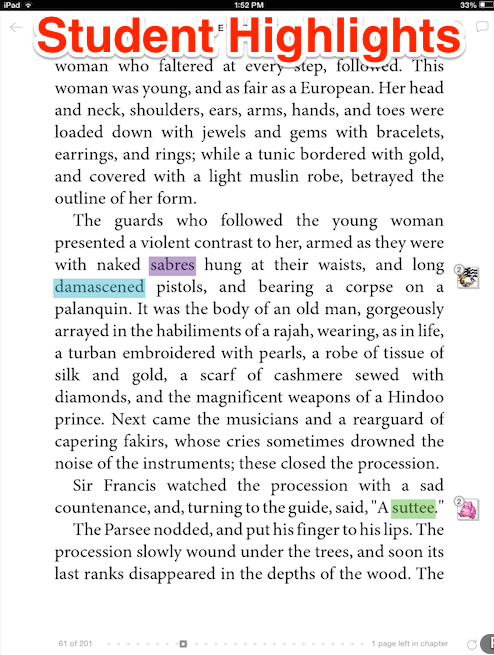 While reading, students highlighted words or entire passages and added notes. They then had the option to share the notes with the group. 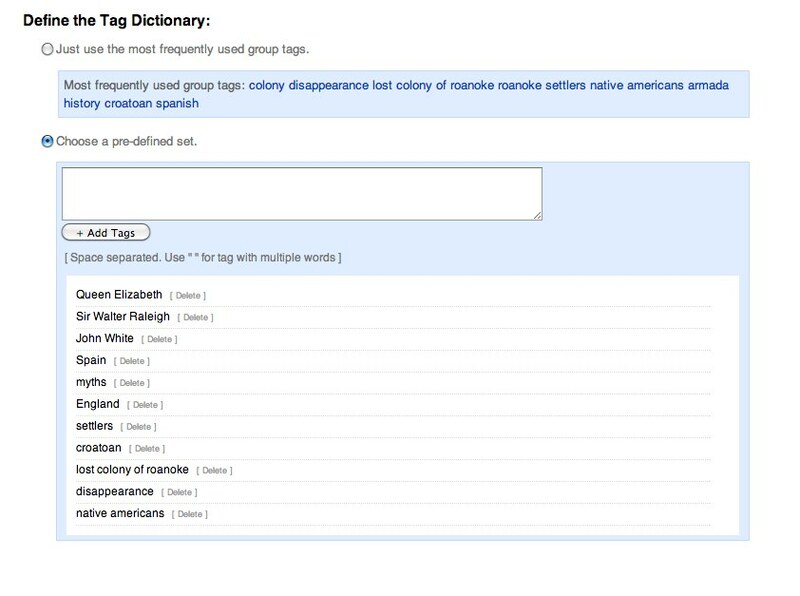 Simply tabbing a word pulled up a built-in dictionary, complete with audio pronunciation of the word and links to search both the Google search engine as well as Wikipedia. The last feature we used is Subtext’s build-in link to Google Drive. 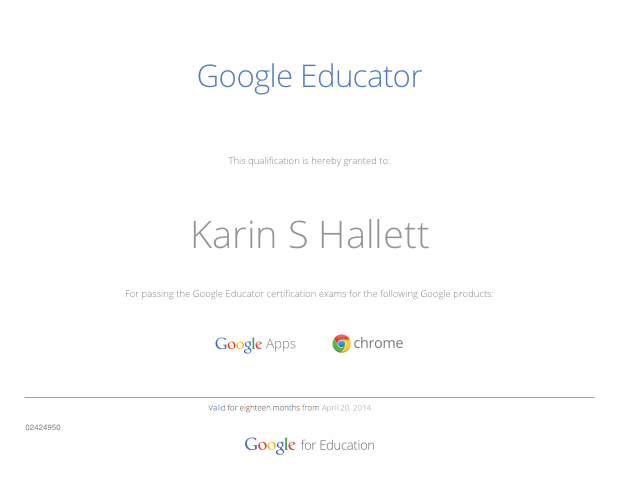 Since our school uses Google Apps for Education, all our students have Gmail accounts and access to Google Drive. We shared a Google Doc of our schedule and this build-in link allowed us seamless access. Would I use Subtext again? Yes! 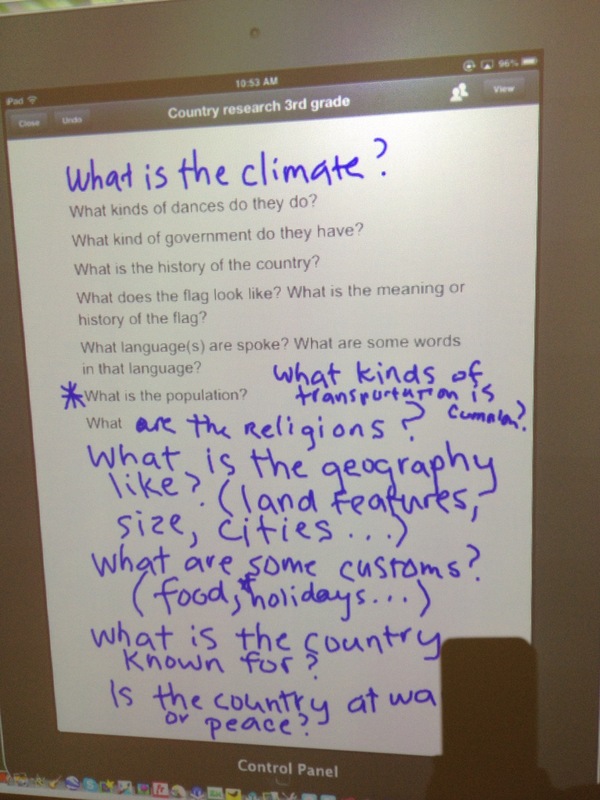 Using the app as a tool allowed students a different way of connecting with our text. 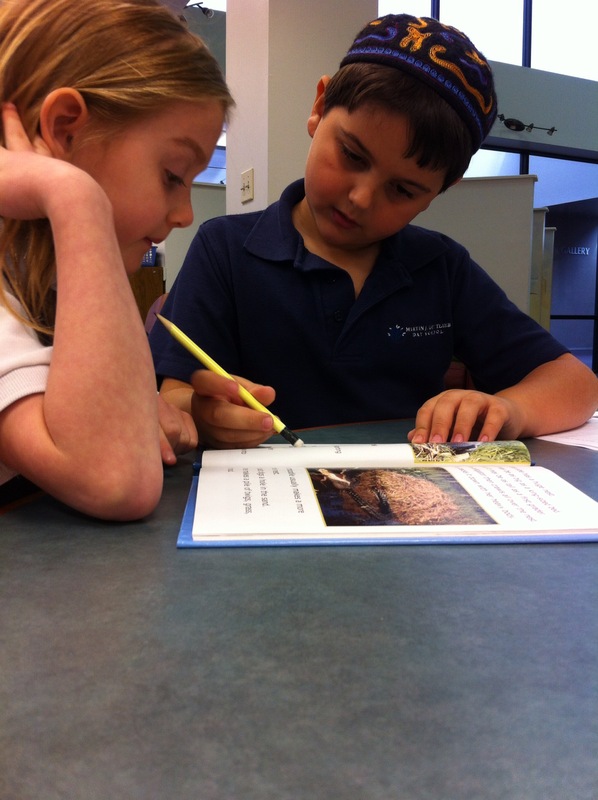 Reading in groups is a social activity where students are learning with their peers. 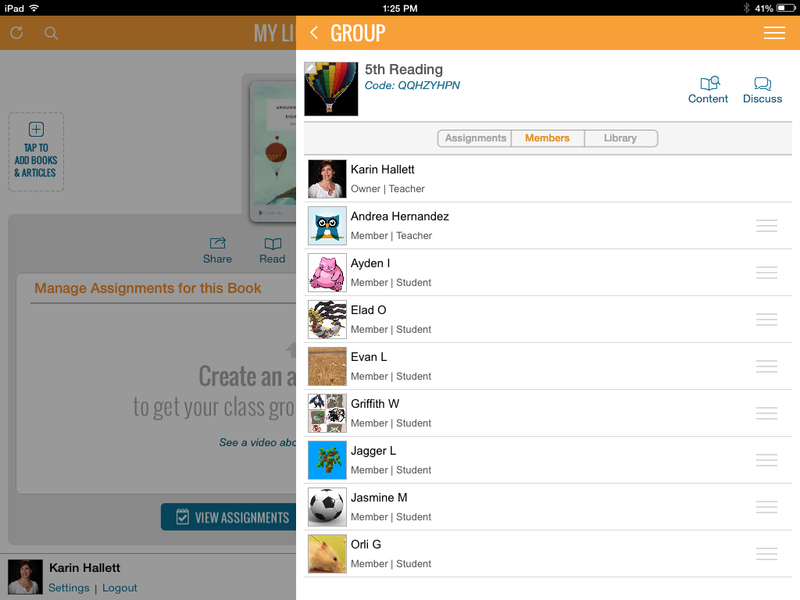 But using this digital tool elevated our small-group reading to a more inclusionary/participatory level by giving even those students who are usually not very vocal an equal voice. 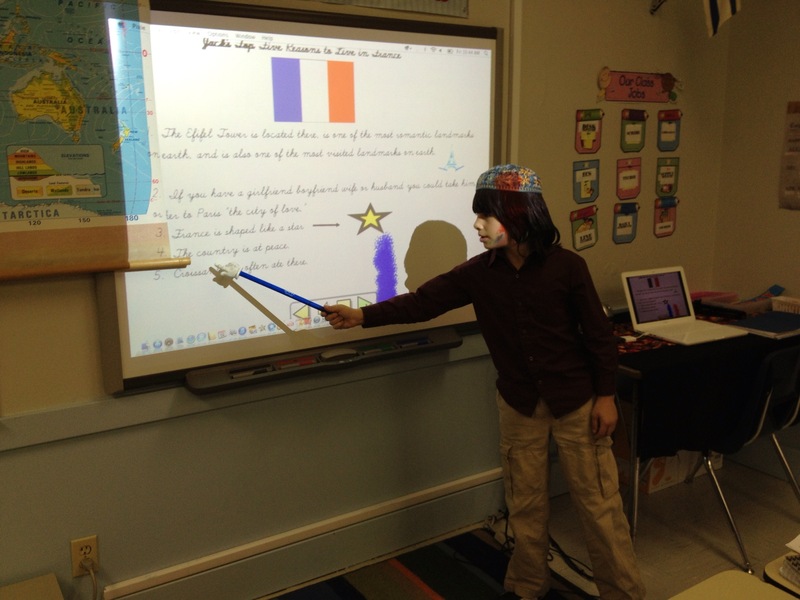 The lesson also demonstrates the power of liquid learning–most of the work was done outside of class. 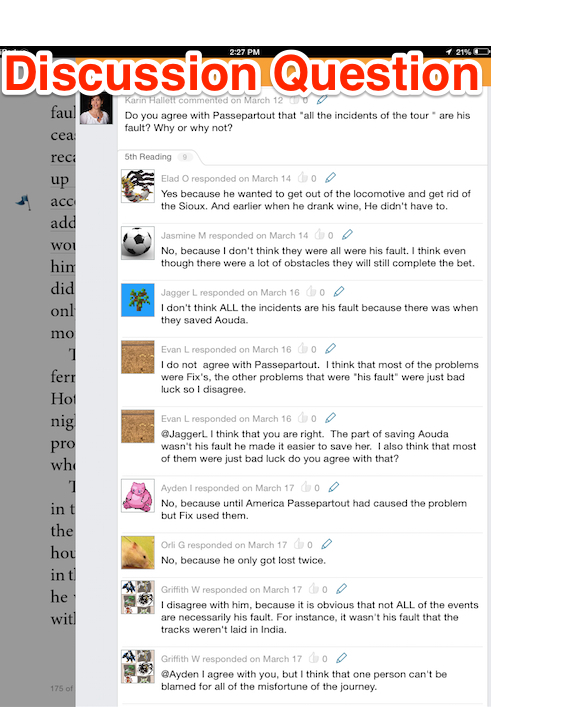 Also, the ability to build-in questions and to embed links facilitated active reading–although some students complained that the “the discussion questions…got in the way when there was a good part.” Most importantly, liquid resources like Subtext enable teachers to transcend the classroom and even school boundaries. 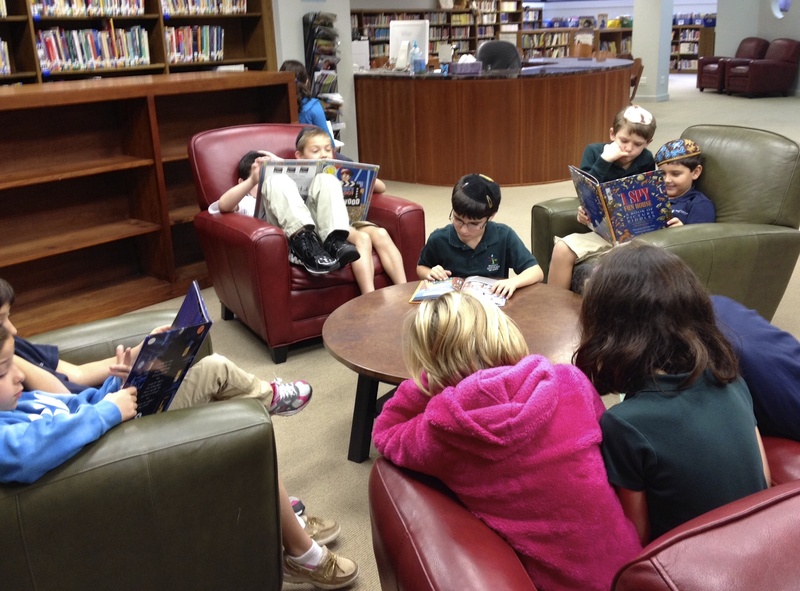 Spending time together with a good book can include students across the room or literally across the world! 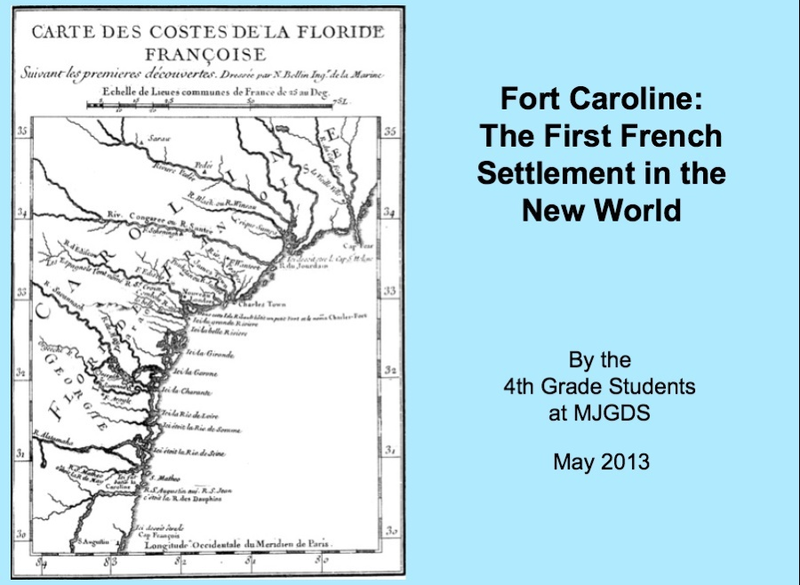 My 4th and 5th grade students finished creating ebooks on Fort Caroline, the first French settlement attempt in the New World, and the Lost Colony of Roanoke, respectively. 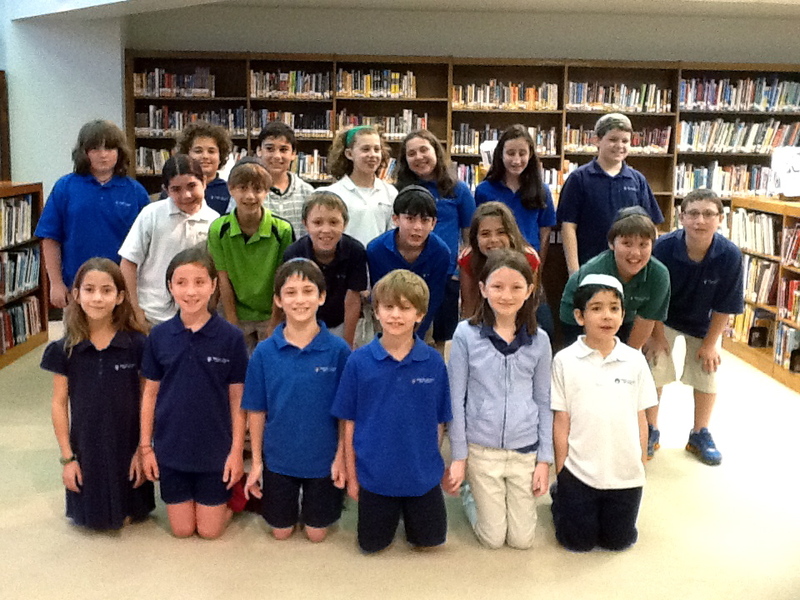 This was a collaborative project with their social studies teacher, Ms. Shelly Zavon. Information sources were web-based, previously gathered, organized, and annotated using Diigo. Each student (5th grade) or student pair (4th grade) contributed a chapter to their class books. 1. Brainstorming. Drawing on their subject knowledge, students began by brainstorming possible chapter topics and then putting them in an order. 2. The Writing Process. 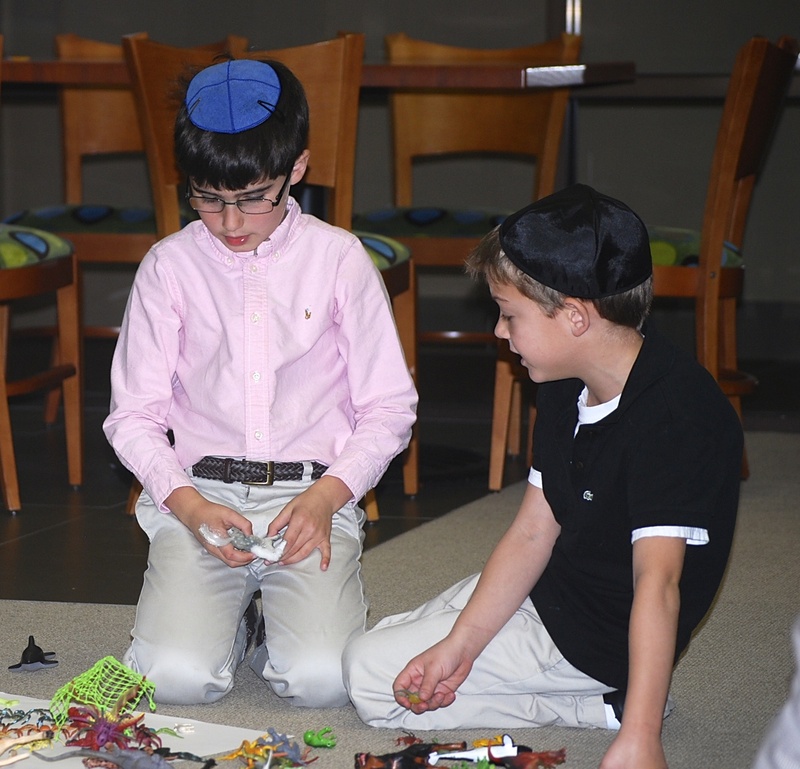 Once topics were distributed, students began the pre-writing stage by selecting relevant websites, reading the information, and taking notes to organize their ideas. 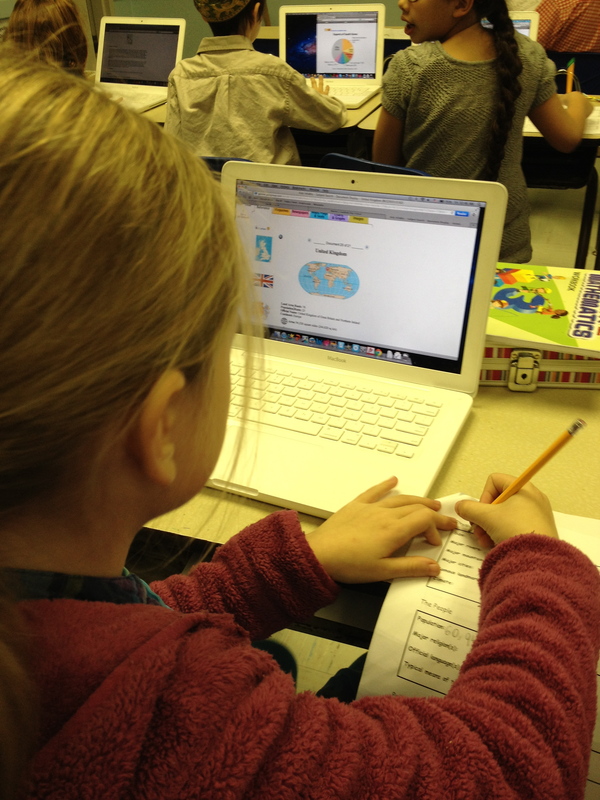 Students used Google Docs and each shared their documents with the classroom teacher and me. This allowed us to provide immediate feedback. 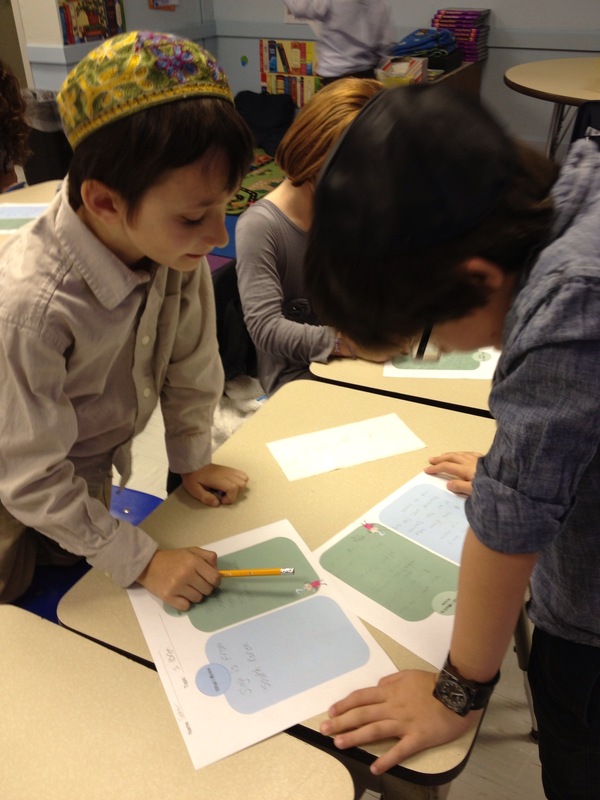 In addition, some students also chose to share their work with friends in the class, seeking their input as well. It was particularly important to provide feedback to students at this pre-writing stage as some found it difficult to narrow information to their particular topic or to simply stay focused on their section of the book to avoid overlapping with another section. And we needed to make sure that facts were accurate. Since the writing process required several stages, including extracting relevant information from the sources, drafting, revising, and editing text, it took multiple sessions. It was very important to me that students take ownership of this project. So, periodically, we checked our progress as a group. We read through all draft sections and checked facts, suggested word choice changes, provided syntax and grammar corrections, and incorporated transitions between the sections. 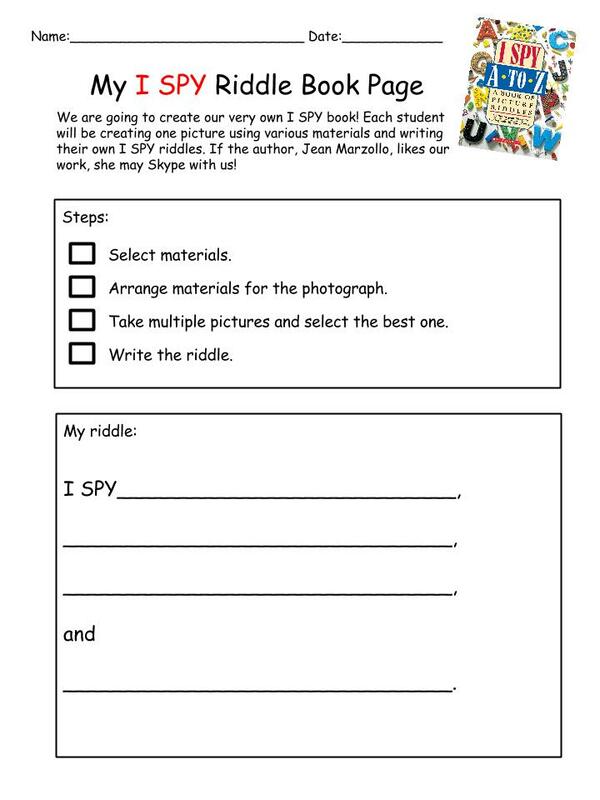 Reading as a group had the added benefit of providing each student with a better idea on their classmates’ content. 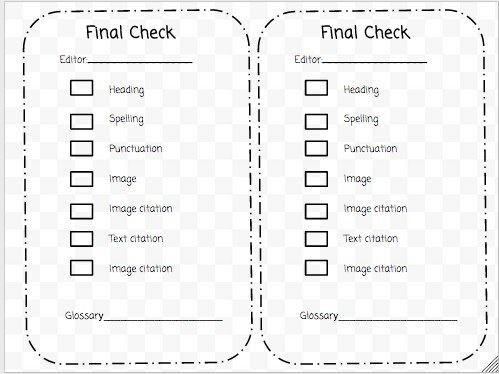 Also, once drafts were complete, I provided each student/student pair with a checklist to ensure writing mechanics were in order. 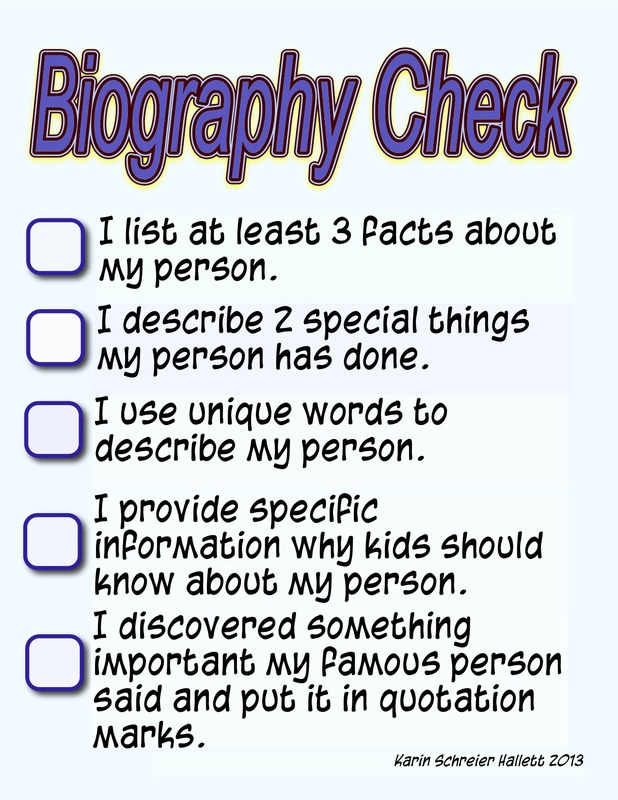 Checklists are a great form of self-assessment for the students that ensure learning and also provide them with a sense of project ownership. 3. Images. Each section was to include at least one relevant image. 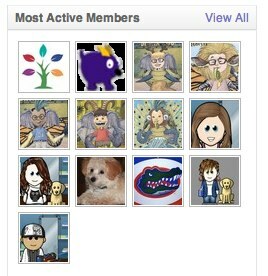 This allowed me to teach a mini-lesson Creative Commons images and where and how to find them. 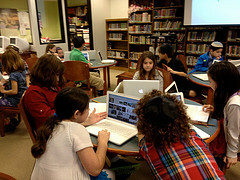 For our history topics, we found Wikimedia Commons a great resource. 4. Information Ethics. 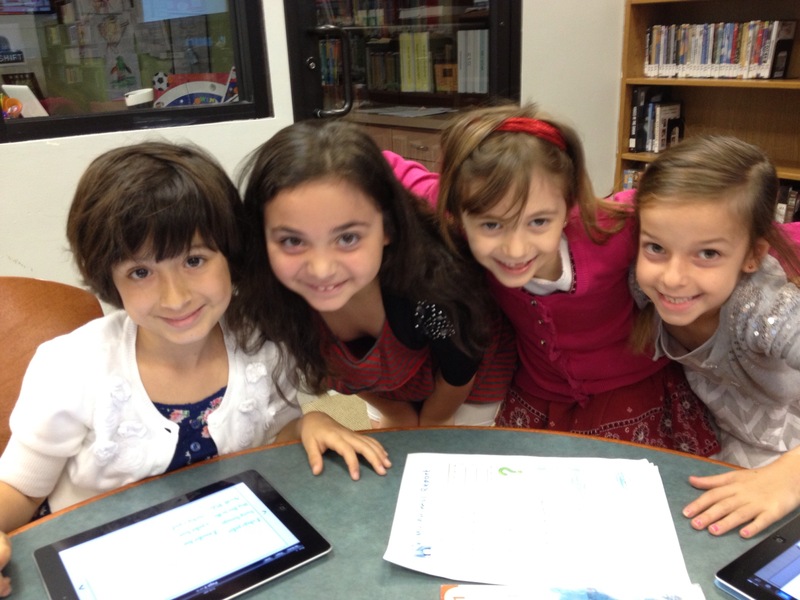 Creating and publishing an ebook is a great tool to teach students digital citizenship. For this project, I introduced an adapted version of the MLA citation style. 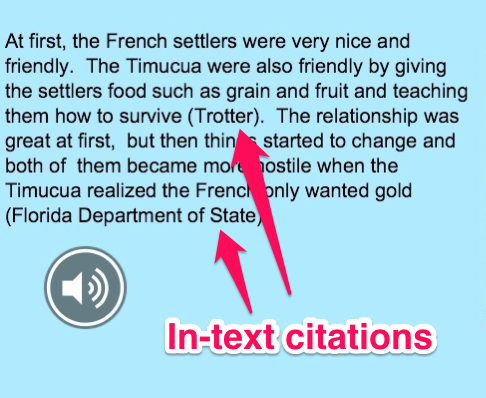 Students learned to create proper citations for both text and images. Their sections include in-text citations. 5. Product. 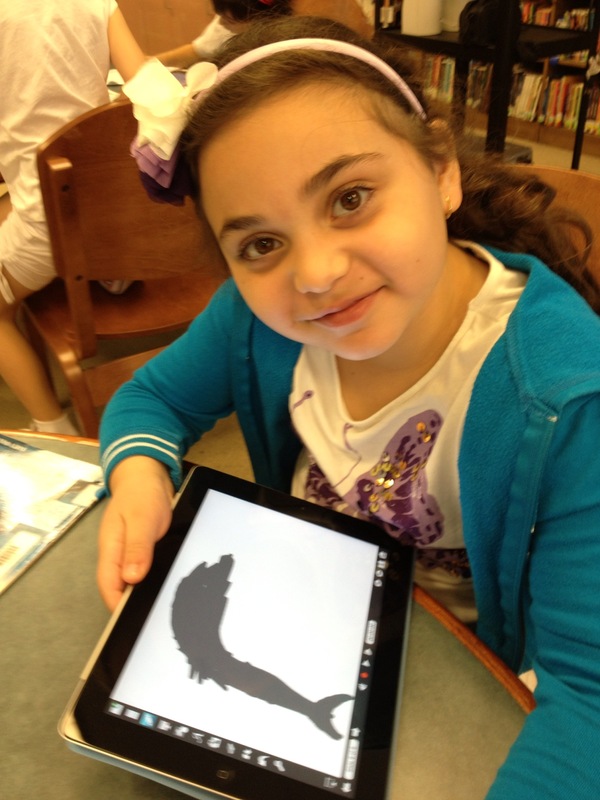 Students used BookCreator app for iPad to create their books. 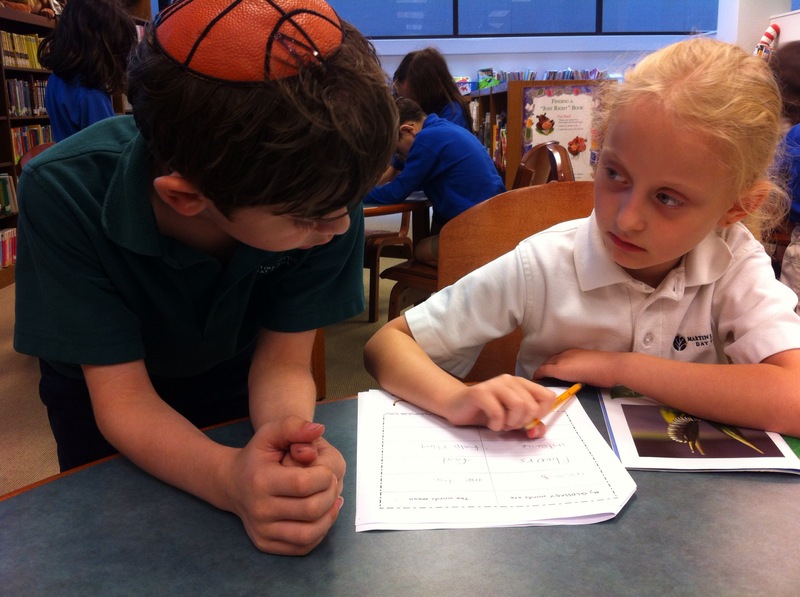 Before importing text and images, students checked each other’s work one last time. For this purpose, I provided them with a Final Check sheet. Fifth grade students also compiled a glossary and editors were asked to identify words/phrases to include in the glossary during the final check. 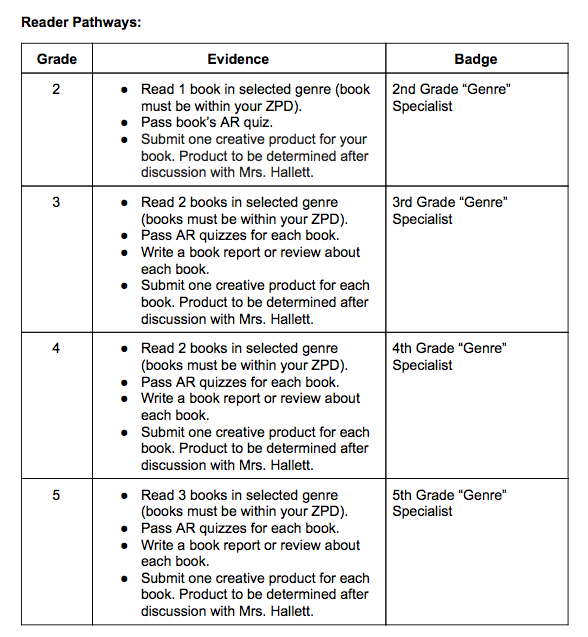 The last step was to decide on a format for the ebooks. 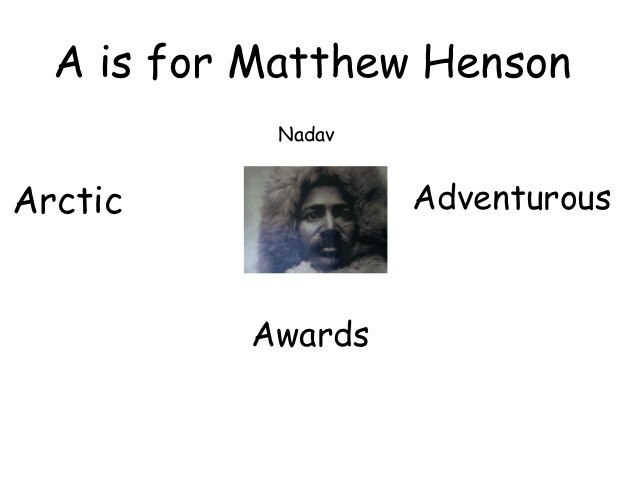 Each class brainstormed several options for font style, color and size as well as background color.Each also co-designed the book covers and wrote group reflections. Once their sections were finalized, they sent them to me via email as ibooks. I combined the books into one and added the Table of Contents, Works Cited, Image Credits, and, in the case of 5th grade’s book, the Glossary pages. The final products are multi-modal, including text, audio, images, and hyperlinks. 6. Assessment. The classroom teacher and I informally assessed both the process and the quality of work through observation and reading of all documents at each drafting stage. If we felt we had to take a step back to bring the group together, we did take the time. 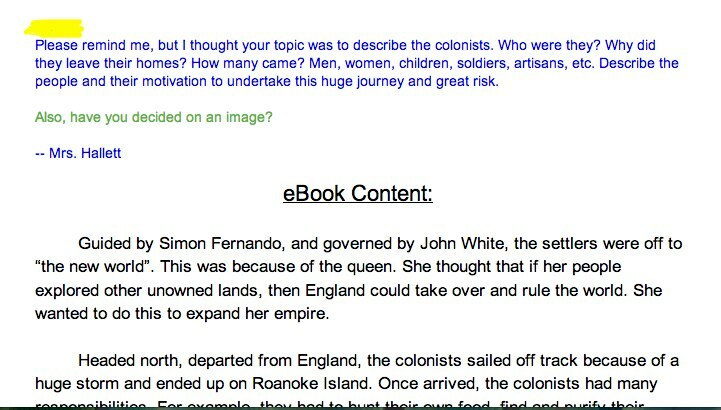 For example, after reading all drafts, we realized that there was some repetition of information between different book sections. 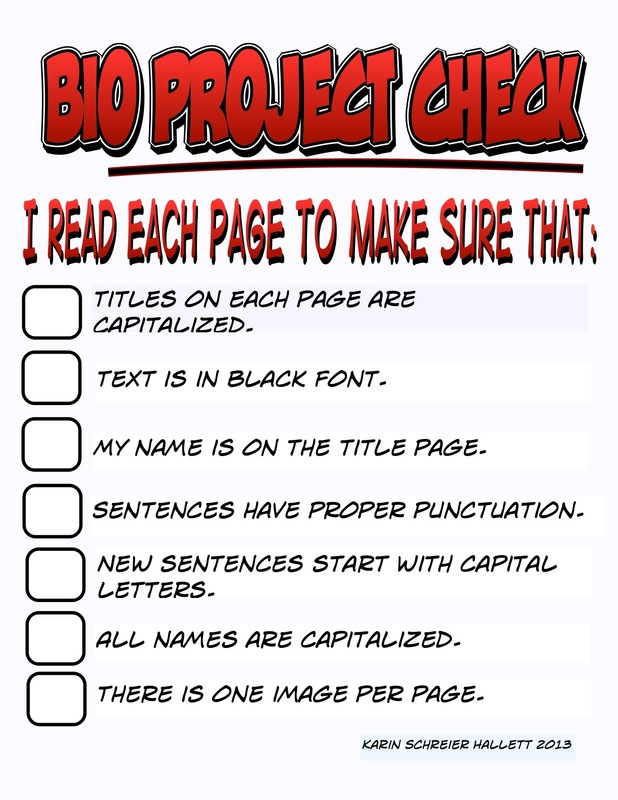 To ensure the students own this project, we then read all drafts as a class to identify repetitive information. We also continually provided feedback on all written work. Most students received comments/suggestions from both of us. 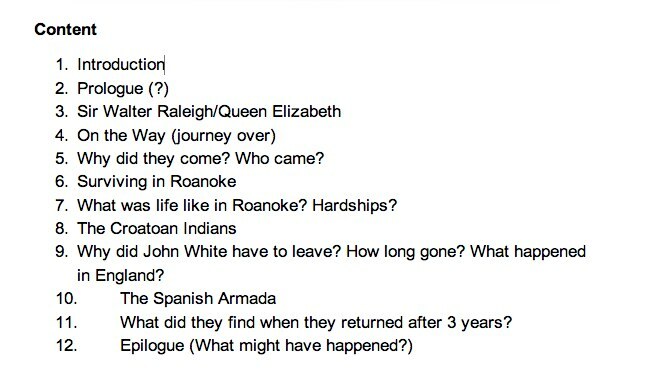 For both my colleague, Shelly, and I this project was meant to not only deepen our students’ understanding of the time periods and historical events they researched by engaging them in the publication of a book, but from the beginning we wanted this to be a student-centered/student-owned project. Creating and publishing ebooks is a very involved process, but it is worth the time spent planning and then guiding the students. 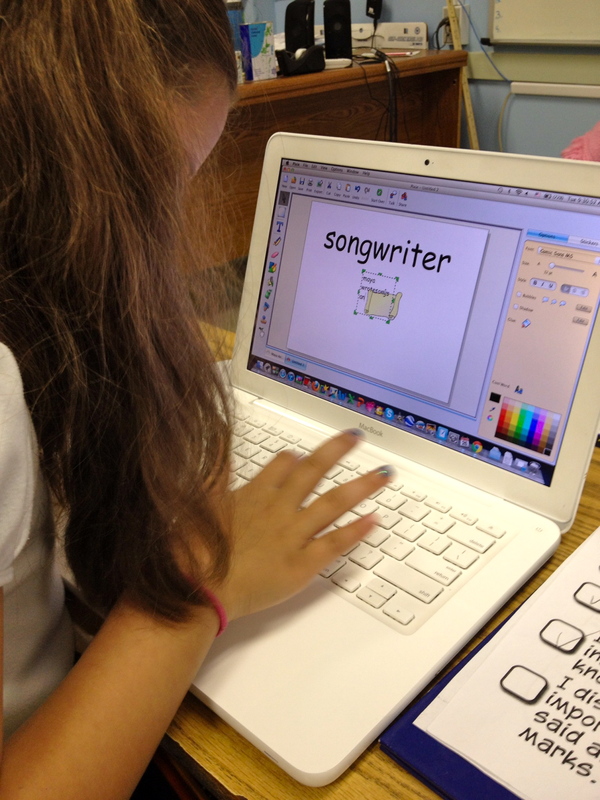 This project promoted the development of multiple literacies. Students learned so many skills, from writing (organization, word choice, sentence fluency, transitions, and mechanics) to editing/proofreading to finding Creative Commons images to citing sources to collaborating to fluently transition between multiple apps (Google Drive, browser, BookCreator) to publishing. 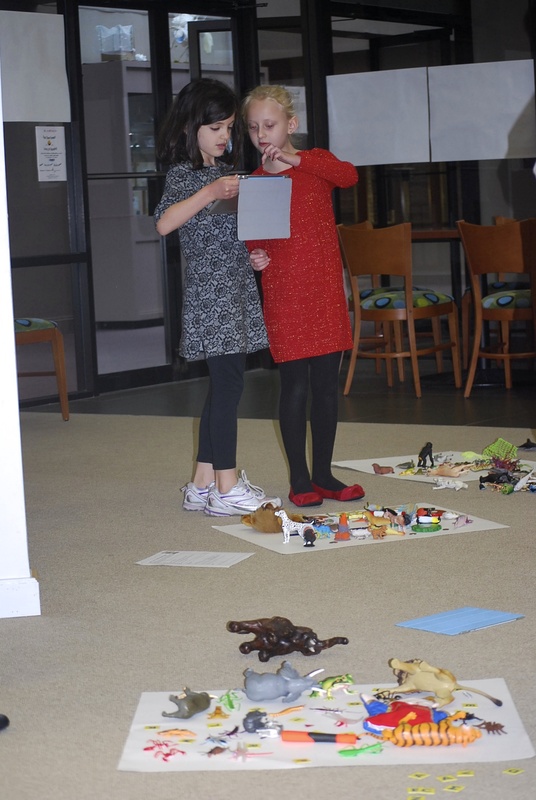 This project incorporated all the hallmarks of modern learning: Creativity, Critical Thinking, Collaboration, and Communication. Should you decide to hop on the ebook publishing train with your students, remember to be flexible and to allow time. Each stage of the project evolved slowly in accord with their own unique tasks–research, writing, publishing. Slow but deliberate work is key. In retrospect, the project was more about the process than the end product, not only for the teachers but the students as well (read the “Project Reflection” pages in their ebooks). My students are sharing their work with a global audience and are looking forward to receiving authentic feedback — from you! Please leave them a comment. 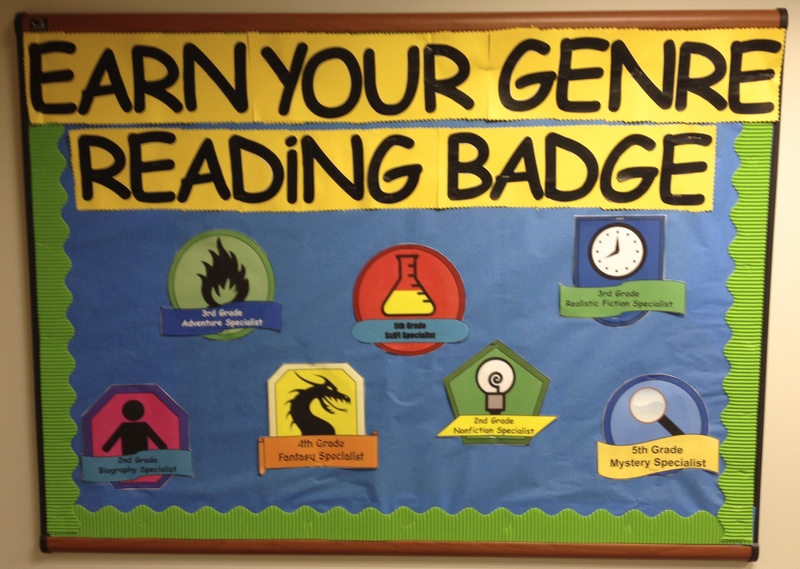 Young readers typically focus on fiction books. 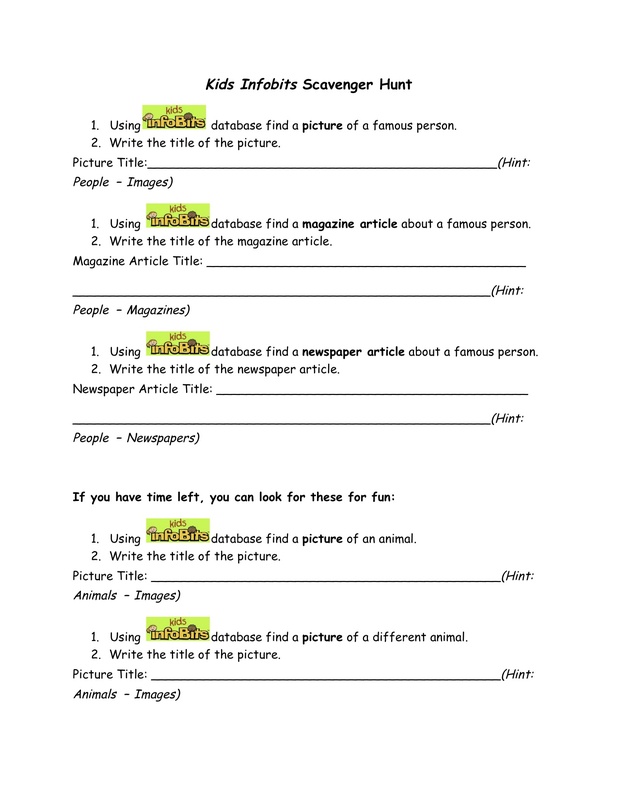 Since a couple of my first graders were showing interest in nonfiction books, however, I thought it would be a good idea to introduce the whole class to this genre and take the opportunity to also teach them about nonfiction text features and some basic research steps along the way. 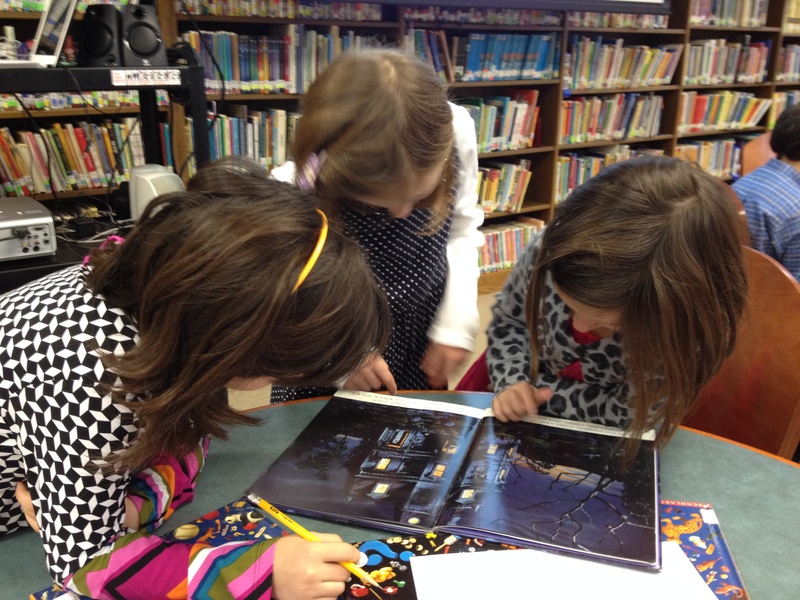 To jump start, I randomly distributed a number of nonfiction books (emergent and fluent reader texts, 0.8 to 4.5 AR book levels) on each of our four group tables and asked students to look through the books, noting any differences to fiction books. I then showed them on the projector screen Big Cats (by DK Publishers) from the wegivebooks.org website. We looked through selected pages and identified various text features, including the table of contents, headings, captions, diagram, and labels, discussing the purpose of each. Since one of my goals was to introduce very basic research skills to this class, we discussed what research is and established that good research starts with a “Wonder” question. 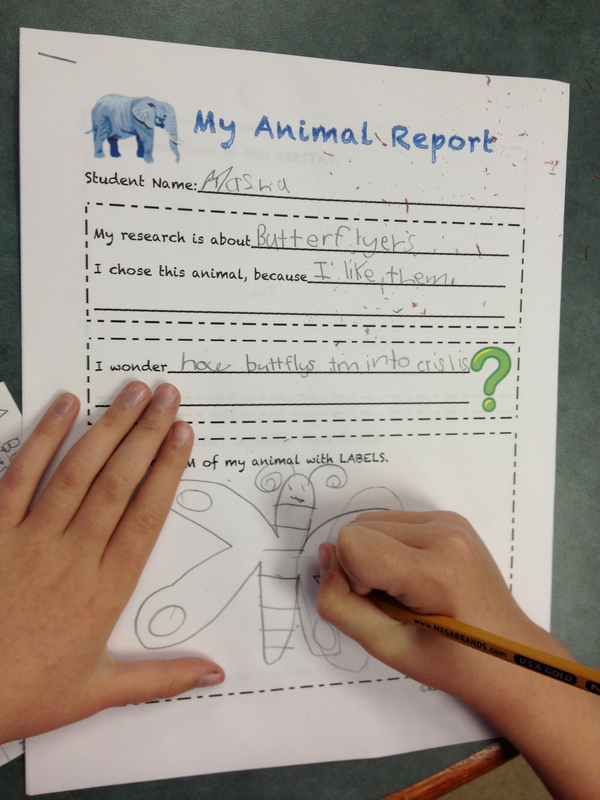 We brainstormed a list of questions students may wonder about an animal. 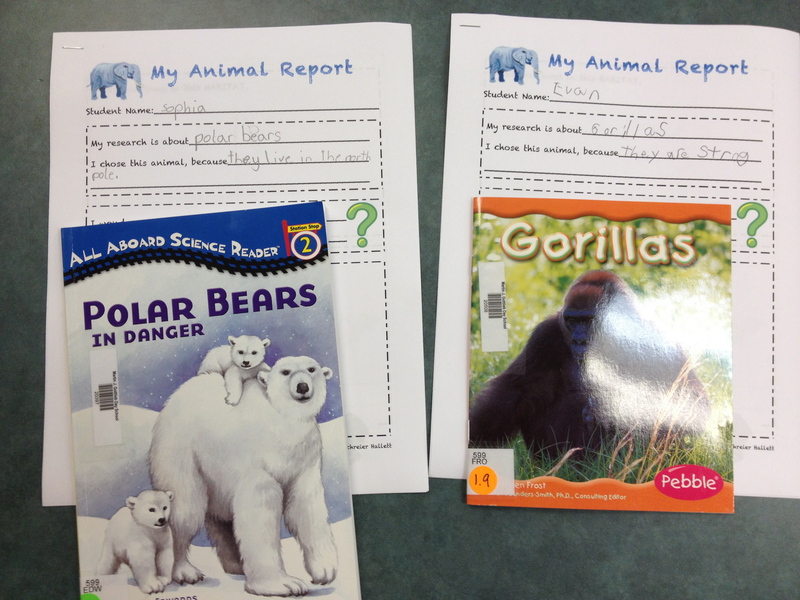 Each student chose a book about an animal on their reading level. 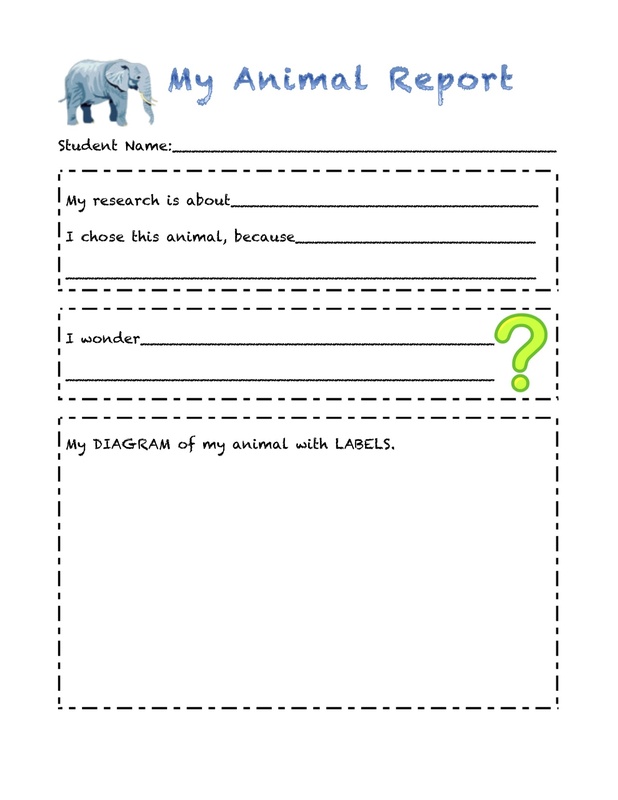 They then thought of a question they were wondering about their animal and wrote it in the organizer I had created. We spent the next two sessions gathering information from the texts to complete the multi-page organizers. Students drew the animal and labeled it. They drew a picture of its habitat and another of its diet. Then they noted at least four facts about their animal. By far the hardest part was for students to compile a five-word glossary. I decided to model this process by reading a section in a book (projected on the screen) and identifying words that provide information about the animal. This process forced students to read their texts closely to not only identify words (or phrases) but also to figure out their meaning. I deliberately approached this project step-by-step rather than let each student work at their own speed. 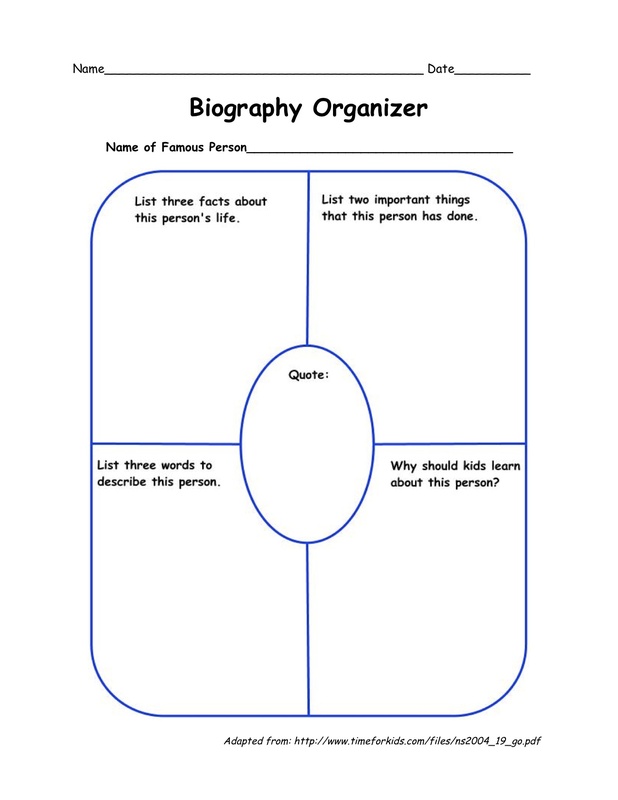 So for each section of the organizer, we discussed the type of information to complete and I either modeled or showed examples. Then it was the students’ turn before we moved on to the next part of the organizer. Those students who completed their sections first worked with classmates who benefited from some help or simply encouragement. 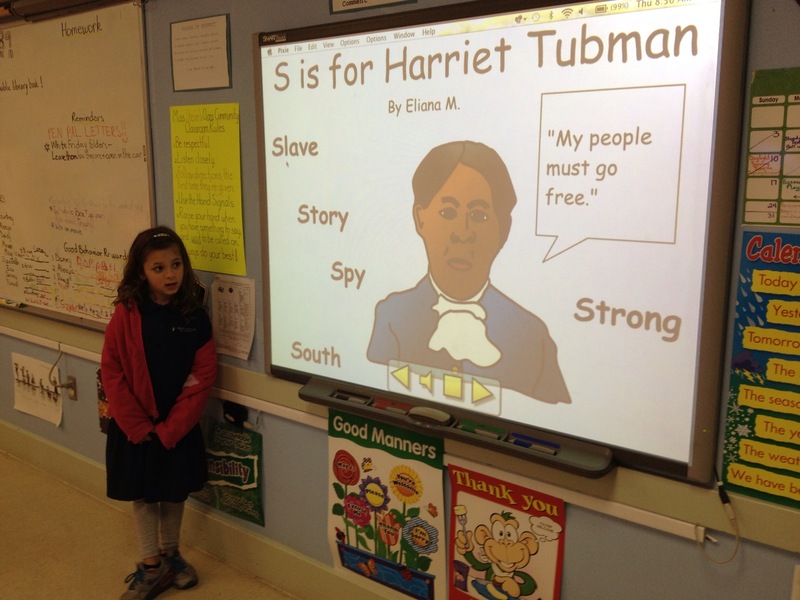 It’s never too early to introduce students to the concept of ethical use of information. So one section of the organizer required the “Source of Information”. We discussed plagiarism and the importance of citing information sources. For our purposes, students noted author names and book titles on their organizers. 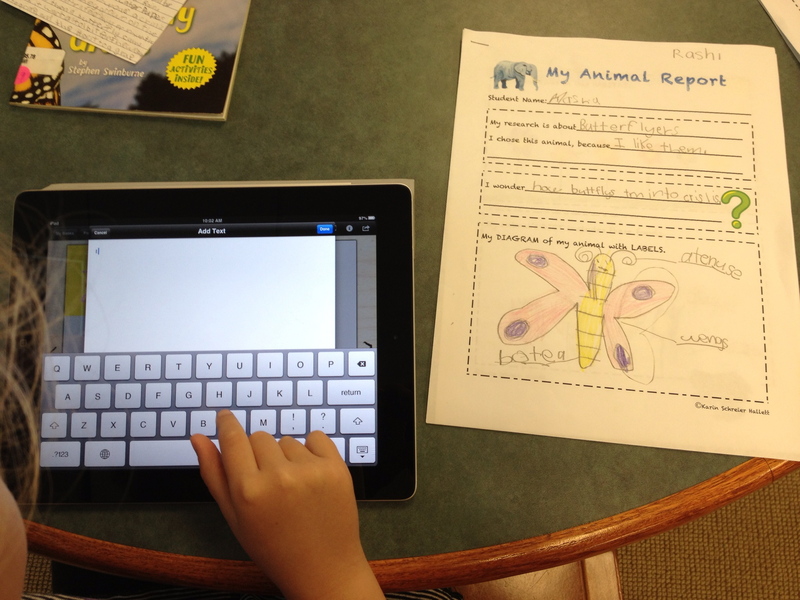 My 1st graders have experience using various iPad apps, including BookCreator, which they’ve used to create fiction books in the Fall. 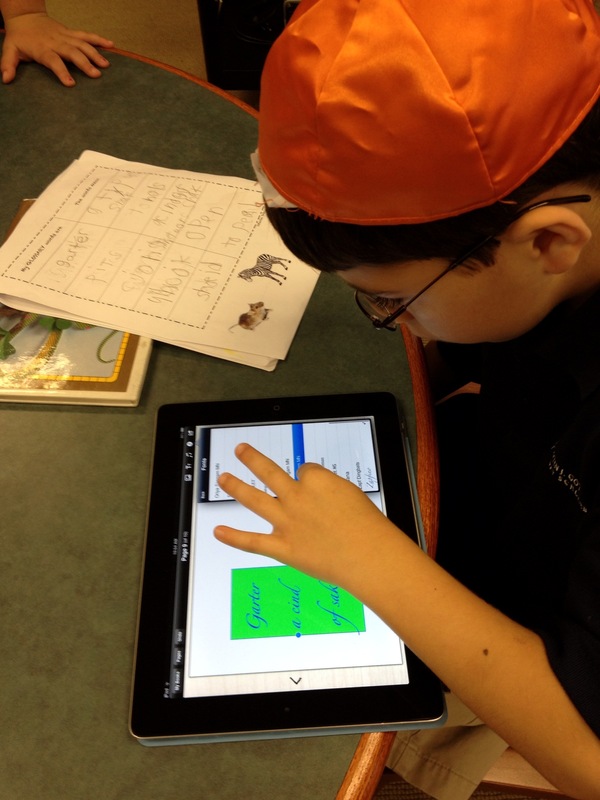 For this project, I wanted students to again use BookCreator to show their learning. 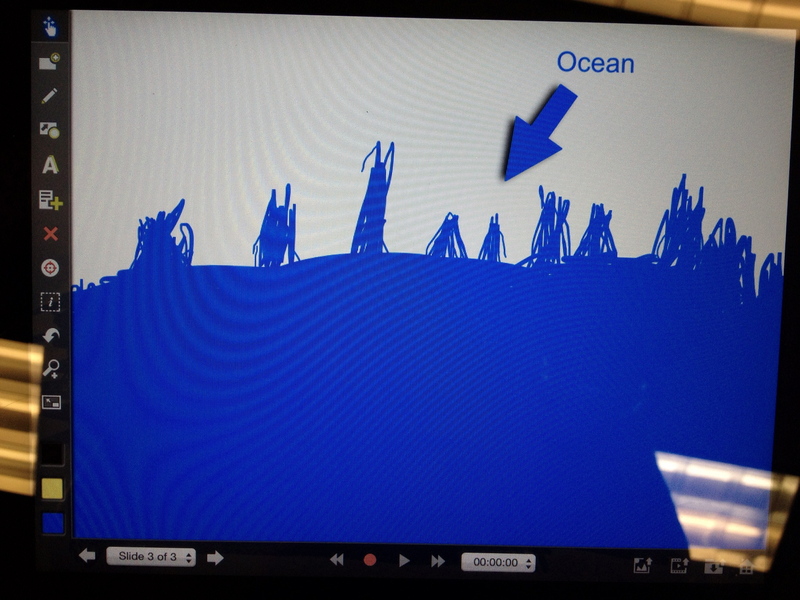 Since it is impossible to create drawings in BookCreator, I decided to introduce the class to ExplainEverything, an app my daughter’s been using for her school work. 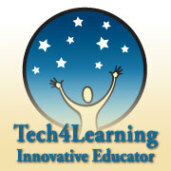 Its a versatile tool for creating and can also be used for screencasting. 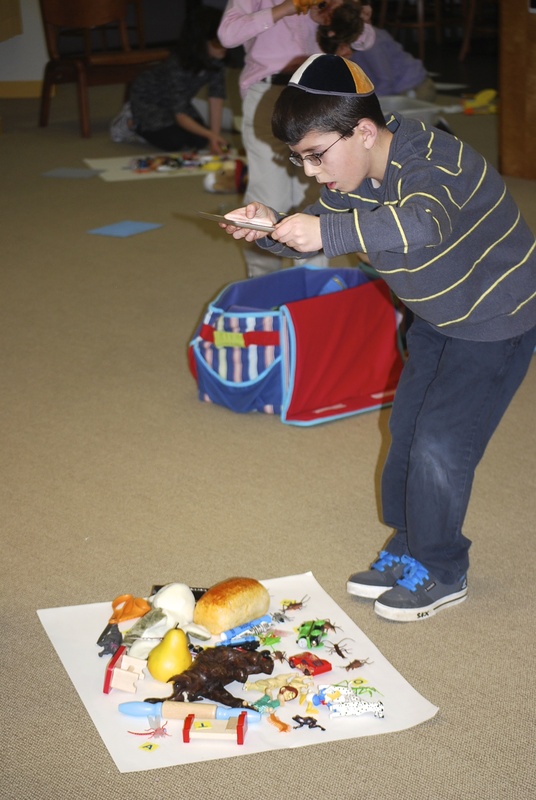 In all, each student created four images: An image for their cover page, a diagram of their animal complete with labels and a picture each of the animal’s habitat and diet. Once finished, the drawings were saved as image files to the iPad’s Camera Roll. The next step was to import the images into BookCreator app for iPad and transfer the text from the graphic organizer to BookCreator. We spent several sessions on this. Each time, I emphasized the need to make sure all required elements are included and sentences have proper punctuation and capitalization. Invented spelling was just fine. 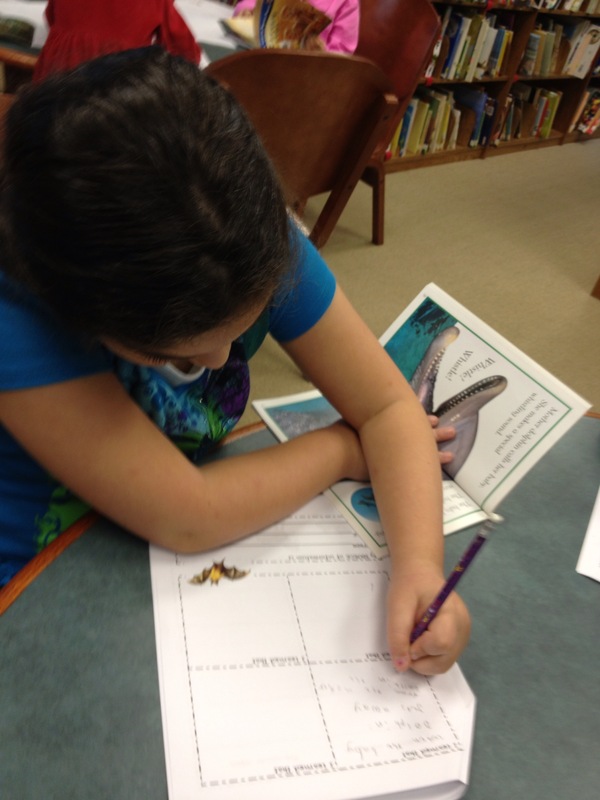 Our last session was a “quality check”: going through the book to check for all required elements (cover page, table of contents, wonder question and answer, diet, habitat, diagram with labels, facts, glossary, source, headings) as well as punctuation and capitalization. I was a bit worried that this project would drag on too long for the students to remain engaged, but they displayed an incredible work ethic throughout. They loved to learn about the animals and at all times lots of verbal sharing of information was going on. 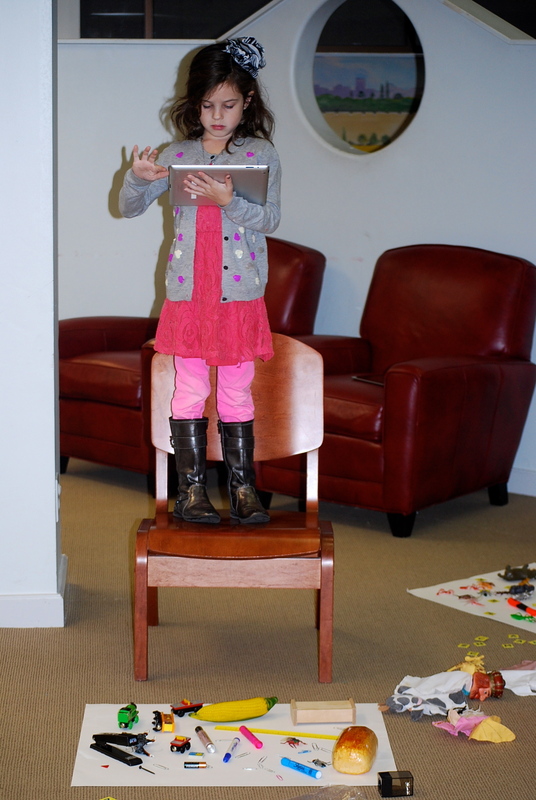 Also, I do believe that the use of iPads helped to keep them motivated. 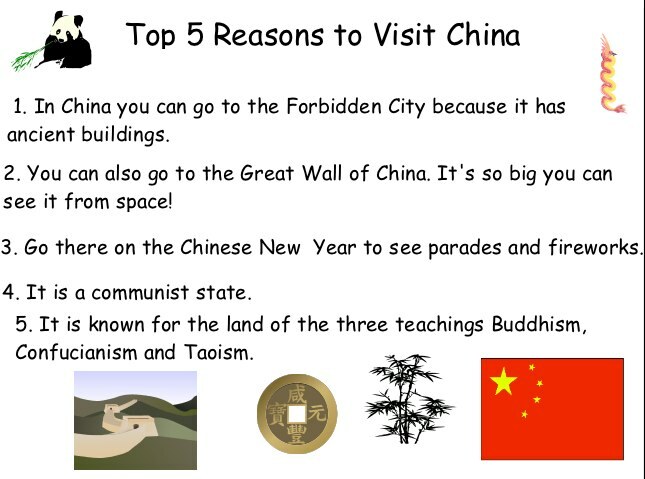 While I required that students included certain text features and information elements), it also was important for me to allow students to exhibit their creative sides. So even though I mentioned that dark text on light background is easier on the eyes, some students just “really liked” the very light turquoise colored letters on white background, or the rather swirly fonts. Not easy on my much older eyes, but the products are definitely the students’! I believe if we want students to take ownership of their learning and products, they must be allowed such simple freedoms. 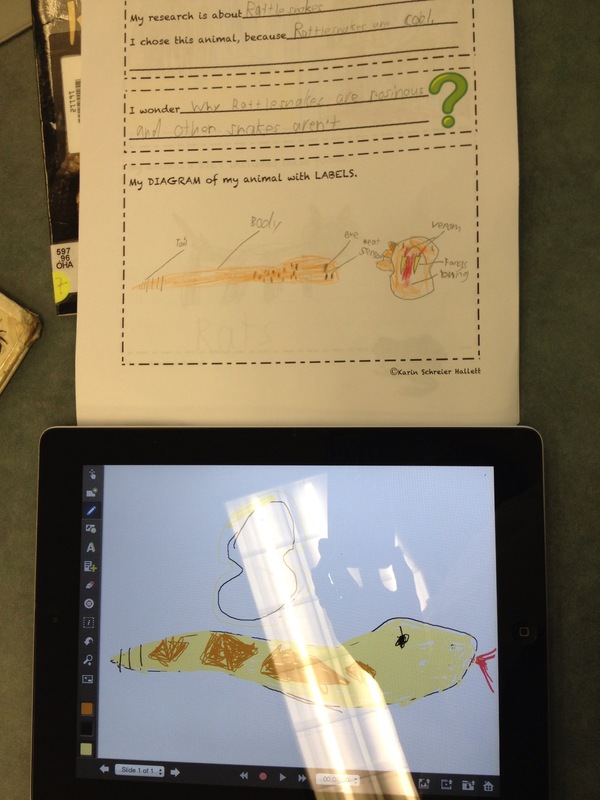 The outcome of the digital nonfiction books is incredible! I am so impressed with my 1st graders’ skills. I feel very lucky to be working with such a creative group of kids. Each of them worked hard on their projects (a total of 13 45-minute sessions) to produce quality books about their research. Their books speak for themselves! 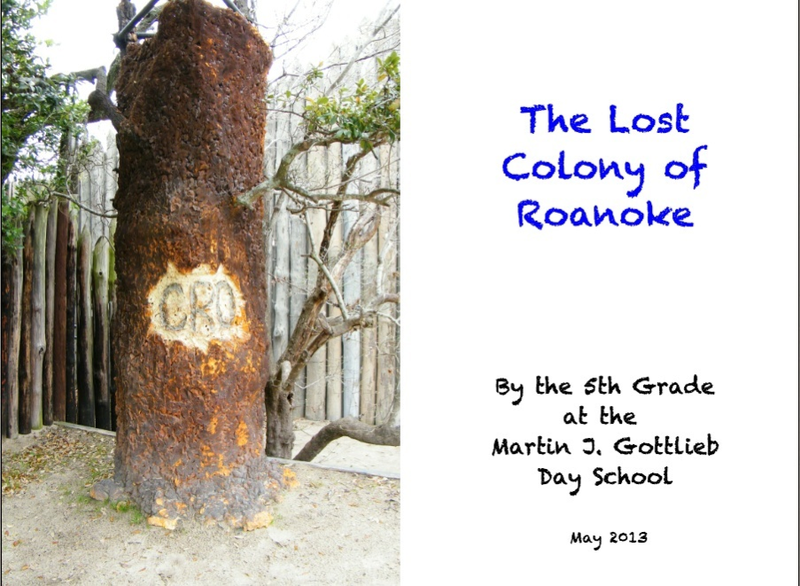 My 4th and 5th grade students are currently writing ebooks: 4th grade on the short-lived local French colony, Fort Caroline, and 5th grade on the Lost Colony of Roanoke. The ebooks are culminating projects based on a previous unit I did with both classes using Diigo to organize information. We began our ebook unit by looking at several excellent student-produced, non-fiction examples I had downloaded from the iTunes store. 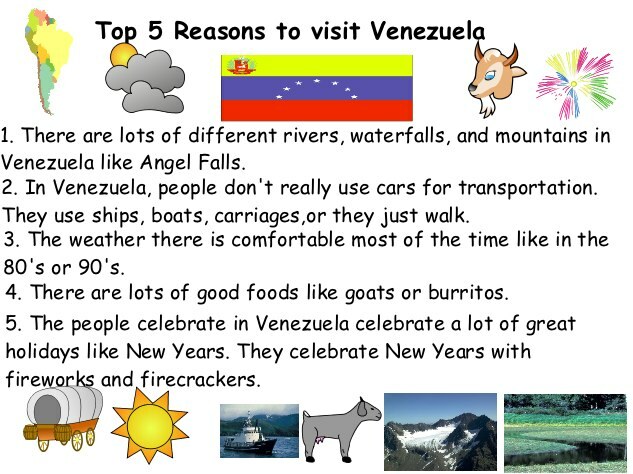 The examples included not only text, but also student-produced images as well as audio and video recordings.The books were creative and informational and served to motivate and inspire my two classes as they have begun the process of creating their own ebooks. In our copy-and-paste information world, how do we teach our students to use information both correctly and ethically? Most of my career, I have worked in higher education. I have spent many hours teaching college students the various citation style formats. Even for these students, it is not an easy, nor enjoyable, task. But, as I tell my elementary students, you may not use someone else’s idea or work product and publish it as your own. It is as simple as that. Also, citations allow readers to not only access the original source, but also potentially find more information. As for understanding the need to cite sources, my students are savvy, already getting lots of practice as regular student bloggers. But creating formal citations is so much harder. Students have to understand not only the various elements of a citation, but also where to locate those pieces of information and then putting it all into the correct format. It is a tedious and time-consuming task, but we are getting there.